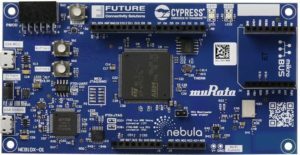 Future Electronics, a global leading distributor of electronic components, has announced the launch of their Nebula IoT Development Kit with partners Cypress Semiconductor and Murata. Kits are now available to purchase for $99. “Murata’s 1DX Wi-Fi and Bluetooth combo module on the Nebula board exemplifies the innovation that differentiates the company. This certified solution is designed to fit into small spaces and uses minimal external circuity. The end result allows engineers to overcome design challenges and launch the products that make IoT a reality,” stated Ghouse Mohiuddin, Business Development Manager. This entry was posted in Europe, Global, Kitting, Kitting, Kitting, North America, On Ticker, PCBs, PCBs, PCBS, Semiconductors, Semiconductors, Semiconductors, top articles, UK. Bookmark the permalink.